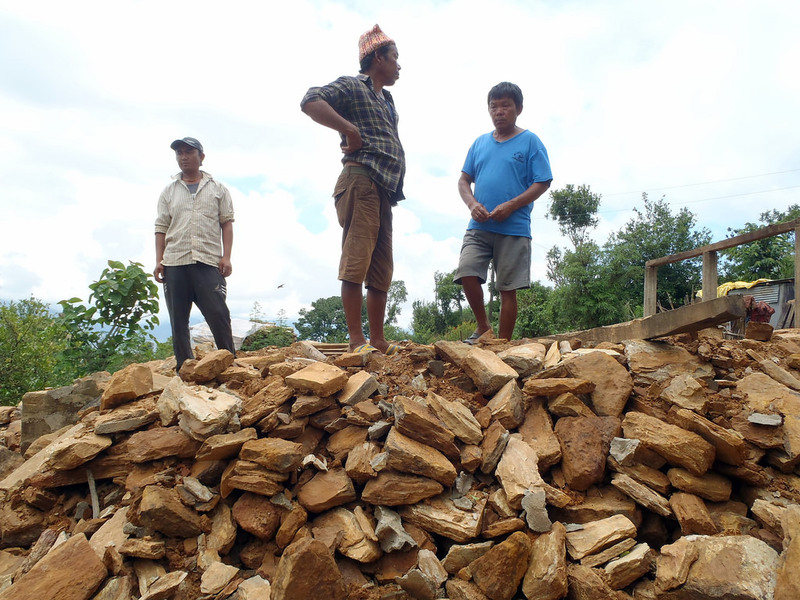 KATHMANDU, Jul 12 2015 (IPS) - 70-year-old Chiute Tamang was working in his field when the earth shook on Apr 25. He grabbed a tree. His wife and daughter were inside the house at the time, but managed to run out. In the blink of an eye, the building turned into a heap of stones. They were the lucky ones. “Earthquakes don’t kill, buildings do” – this otherwise common knowledge – had just reached Nepal. Almost all the victims were buried in the rubble of their houses made by untrained masons of stones barely stuck together with mud. It is a very popular method, because it is the cheapest – stones and mud are free, bricks and cement cost. In Ramche, Chiute’s village scattered over the terraced hills of district Dhading, 38 km northwest of Kathmandu, 168 houses out of a total 181 are no longer inhabitable. According to the latest government report, the disaster damaged 607,212 buildings in 16 districts. Of them, 63 percent in areas dominated by Tamangs – the largest and the most destitute group among the Tibeto-Burman speaking peoples of the Himalayan region – although they constitute less than six percent (1.35 million) of Nepal’s population. ”Earthquakes don’t kill, inequity does” – out of 8,844 people who died in the earthquake, 3,012 were Tamangs. Over 50 percent of the victims belonged to the marginalised communities. More than half the victims were women. Ramche is a Tamang village. Some of the people own small plots of land on which they grow corn and potatoes of walnut size, but crops can feed the farmers’ family only for two to three months. For the rest of the year they live on contracted labour. The residents of Ramche admit they are very poor. Why? Because, their answer goes, their fathers were poor, as well as the fathers of their fathers. They accept this as a judgment of fate and do not feel discriminated against, only showing how inequity is grown into the tissue of the society, the result of concerted exploitation for centuries. This brawny hill tribe has always provided a labour reserve pool for the rulers of Kathmandu. In the past, Tamangs were prevented from joining the administration and the military. Even today they may man the barricades but have little role in the upper hierarchy of the armed forces or police, and are unrepresented in the country´s national affairs. Being Buddhists did not immunise Tamangs from the caste system evolved by ruling Hindus. Those who wield power belong to Brahmin, Newars and Chhetri people and these “well-born” elites look down on the Tamangs. Economic deprivation has increased the influx of indigent peasants to the job markets of Kathmandu, where they make up half of the porters and the majority of three-wheeler tempo (”taxi”) drivers. Prison surveys have shown that a disproportionate number of Tamangs are behind bars for criminal offences. They have never counted on any government’s help, and this time is no different. After the earthquake, the residents of Ramche helped each other, cooked meals together and joined hands to raise themselves up from the rubble. With a little help from NGOs, the situation was brought under control. One week after the disaster, the residents of Ramche were given blankets, tarpaulins and mosquito nets funded by the European Commission’s Humanitarian Aid and Civil Protection department (ECHO). Today, the whole village is queuing at the barracks where ADRA, the Nepalese NGO, is handing out big plastic water jars with the blue logo of the European Union and “sanitary kits”: a few tubes of toothpaste, toothbrushes, water purification tablets, sanitary napkins and birth control pills. A young female activist tirelessly explains to one villager after another how to use these items. Chiute Tamang’s family spent the first three days after they lost their house in a flimsy hut cobbled together with a few pieces of wood. Then made a tent of tarpaulin, where they moved together with goats, their most valuable asset. Livestock, the old man explains, must not be left outside at night because it could fall prey to tigers or leopards. After one week, Chiute borrowed some money, bought materials and with the help of his neighbours put a house together for himself, his wife, their youngest daughter and her husband. It has a simple design – a one-room cabin made of a wooden skeleton encased in corrugated iron, the floor covered with oilcloth, and equipped with simple beds, cupboards and a gas cooker. Construction took two weeks, because the wood had to be brought from a distance. 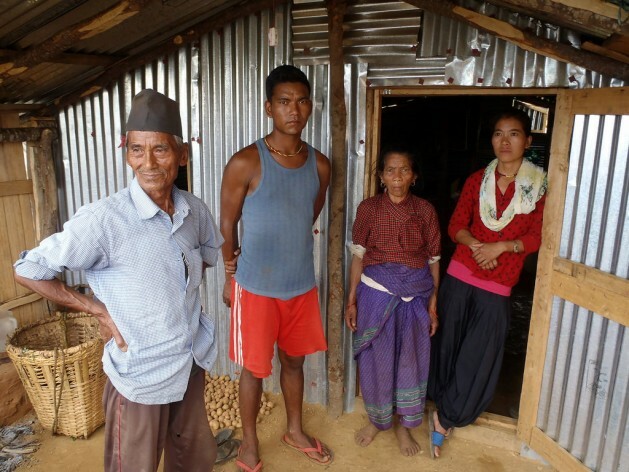 When the house was already standing, the government finally sent some relief – any Nepalese family who lost a house is entitled to a 15,000 rupee (150 dollars) loan. Chiute could pay off half the loan. Another Ramche resident, 29-year-old Deepak Bhutel, received 180,000 rupees but he had been less fortunate – his wife and 18-month-old daughter lost their lives under the rubble of their stone house. The amount would be enough to buy a sturdy house, certain to survive any future earthquake but Deepak, together with his older and now only daughter, says he is also going to end up in a corrugated iron-clad cabin. Having lived from hand to mouth all his life, he says he does not want to spend all his wealth on the house. Only time will tell if, in the process of planning reconstruction, the government of Nepal will use an opportunity to find out why the Tamangs are so vulnerable to natural disasters and what can be done to protect them from future calamities. Past mistakes should not be repeated, warned Jagdish Chandra Pokhrel, former Vice Chair of National Planning Commission, quoted by ‘Nepali Times’. Pokhrel recalled the example of the Tamangs displaced when the reservoir in Makwanpur was built in the early 1980s. Around 500 families whose lands were acquired by the authorities did not want cash compensation but resettlement elsewhere.